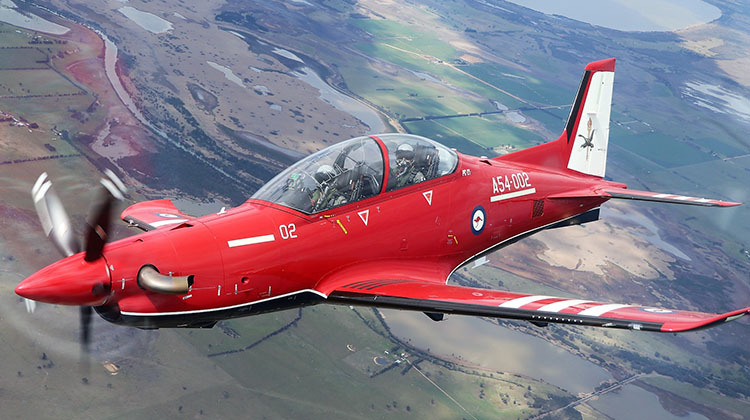 Heralded in by the arrival of the new Pilatus PC-21, a change is coming in the way that future generations of Australian Defence Force pilots will earn their wings. The new process extends, literally, from the ground up, and exciting times are ahead. The halls of the Central Flying School (CFS) at East Sale silently speak volumes of the Royal Australian Air Force’s past, where rows of photos of pilot trainees date back to course number one in 1913. In that first image, a young Army Lieutenant, Richard Williams, is one of four trainee pilots seated in front of a frail-looking Bristol B.E.2 biplane. Williams would rise through the ranks to become known as the ‘father of the Royal Australian Air Force’. From its origins at Point Cook, CFS evolved through several changes over the ensuing years before settling at East Sale in 1947, where it was charged with the responsibility of overseeing pilot standards in the peacetime RAAF. It also was entrusted with training the Air Force’s flying instructors, graduating its first course in 1948, and CFS is also home to the Roulettes aerobatic display team. Today CFS has its eyes firmly set on the future of pilot training. Its home at East Sale is currently undergoing a major facelift with new aircraft and new facilities emerging in preparation for the AIR 5428 Pilot Training System project, which is promising a step change in how future Defence Force pilots are trained. AIR 5428 is an integrated system designed to train all future Royal Australian Air Force, Royal Australian Navy and Australian Army pilots. The project spans flight screening through all phases of pilot training from basic flying training at CFS through to the advanced flying training at 2FTS (No 2 Flying Training School) at RAAF Base Pearce, north of Perth. The first intake of pilots at East Sale under the new scheme is scheduled for 2019, but already the signs of change are evident. Currently, flight screening and basic flying training is undertaken by the Australian Defence Force Basic Flying Training School (BFTS) at Tamworth in New South Wales. 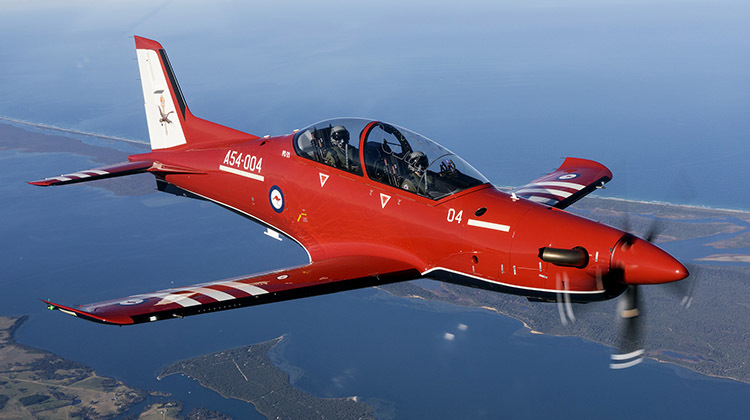 Operated by BAE Systems Australia with a mix of Defence Force and civilian staff, at BFTS pilots from all three services train on the CT-4B Airtrainer. 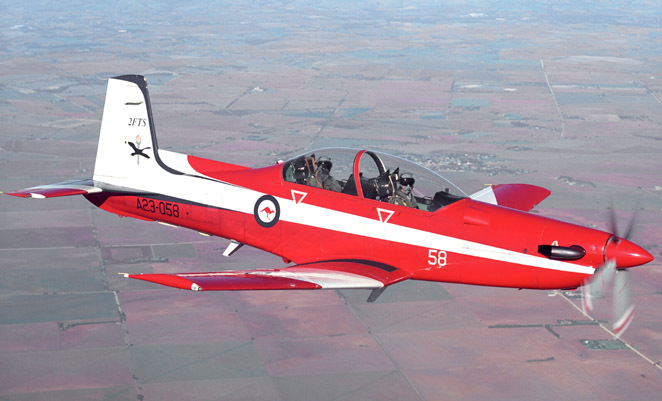 On completion of their basic flying training, RAAF and RAN pilots then move on to 2FTS at Pearce for advanced flying training on the Pilatus PC-9/A, while Army students complete their training at the School of Army Aviation in Oakey, Queensland. Under AIR 5428, BFTS and flight screening and basic flying training for all three services moves from Tamworth to East Sale. The change of state also heralds a step-change in aircraft type, with the venerable CT-4B replaced by the PC-21. All future ADF pilots will undertake their first training sortie at the controls of a 370kt-capable, 1,600shp turboprop trainer with state-of-the art digital avionics – a hugely different proposition to the 210hp, piston-powered CT-4B, with its fixed-gear and analogue dials. In order to facilitate such a transition, much more than just a change of aircraft type must be addressed. Already, the ground training facility is taking shape on the East Sale site. Resembling a modern university campus, its design also represents a modern approach to educational philosophy. From a central foyer, a pair of two-storey wings branch off. Contained therein are modern classrooms, briefing rooms and offices for students, instructors and management. All are logically laid out for the flow of students and staff and will be fully networked to integrate the new training systems. The classrooms will boast the latest technology and mission planning and de-briefing tools, while to the rear will be an open-plan space where students can work in groups or take a respite break as the situation dictates. Sensibly, this area looks out over the PC-21 flightline which will undoubtedly serve as a source of motivation. The facility is also home to the Lockheed Martin-operated PC-21 simulator, or flight training device (FTD). From the outset students will use the sim to develop both their aircraft handling and flight and system management skills before they take a seat in a real aeroplane. A third area contains logistic support and maintenance facilities. Well thought out, the maintenance area offers ground crews undercover facilities and respite from the Victorian winter. Additionally, should significantly adverse weather be forecast, the building is designed that with rearrangement, all 22 PC-21s to be based at Sale can be moved indoors to take shelter. It is past this maintenance area where crews will digitally sign for their aircraft before moving onto the apron and the awnings beneath which the PC-21s will await at the ready. The entire site is logically laid out and will be very well equipped when it is complete. Its design directly addresses the fact that the learning process in the modern age is a different proposition and that commencing flight training on the impressive Pilatus PC‑21 calls for a new approach to training. But as impressive as the facilities are, it is just one element in the new training path and therein lies the key. Change and challenge have always travelled together. At first glance, the concept of new pilots undertaking their first training flights in a PC-21 seems akin to a first-time athlete lining up at the Olympics. However, under the new training system a great deal will take place before any flight occurs, with the intelligent use of training aids and a graduated process key to reducing a leap to carefully measured steps. The first of those steps will take place on a laptop, or personal learning device (PLD). 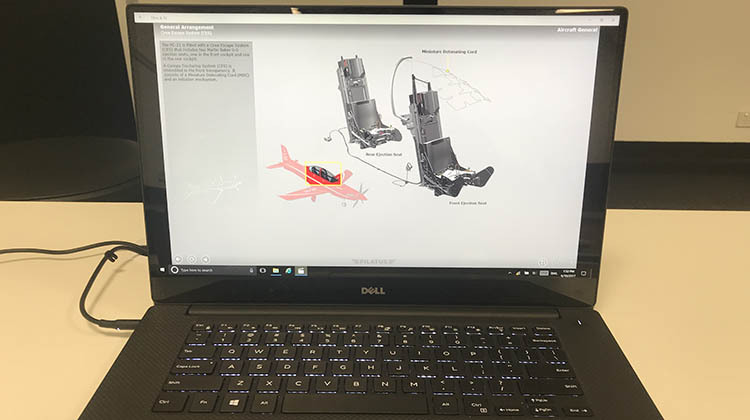 Pilatus software takes the student through an interactive PC‑21 systems course, offering the ability to not only read a description but sight the operation of the system and the cause and effect of actioning a switch. Also on the PLD is Lockheed Martin’s ‘Prepar3d’ software (pronounced “prepared”) which provides a visual simulation platform to create training scenarios. Prepar3d is built upon and significantly evolved from Microsoft FlightSim, and students will use it to fly an exercise or manoeuvre as many times as they may wish, pausing to review the flight from within the cockpit, or observing from an external viewpoint. The next stage is the cockpit procedure trainer, or CPT. Procedural trainers are not new and in their most basic form are a reproduction of a cockpit’s panels, printed out and set about a chair, allowing the trainee to touch-drill sequences. Perhaps not surprisingly, the PC-21 CPT is far more advanced. Sitting on a movable cockpit-style seat, the student is surrounded by three very large screens ahead, slightly angled and portraying a virtual world picture, and one smaller screen below the centre screen, representing the PC-21’s instrument panel. The central large screen also displays the aircraft’s head-up display (HUD). Either side, at thigh level, are two rectangular casings containing touch-screens representing the switching panels contained within the PC-21’s cockpit. To the left is a throttle and centrally, extending from the floor is a control column. Each has a variety of function switches which conform to the ‘hands on throttle and stick’ or HOTAS philosophy. Building upon the foundations of the PLD, the cockpit procedure trainer allows the student to not only learn their procedural checks and sequences, but effectively fly a sortie from engine start to shut down. While the trainer is not a simulator – its elements are not to scale, nor is it designed to fully replicate motion – it is yet another smooth transitional step allowing the student to move towards the ultimate goal of flying the sequence in the air. The final piece of hardware in the chain that precedes flight is the simulator. 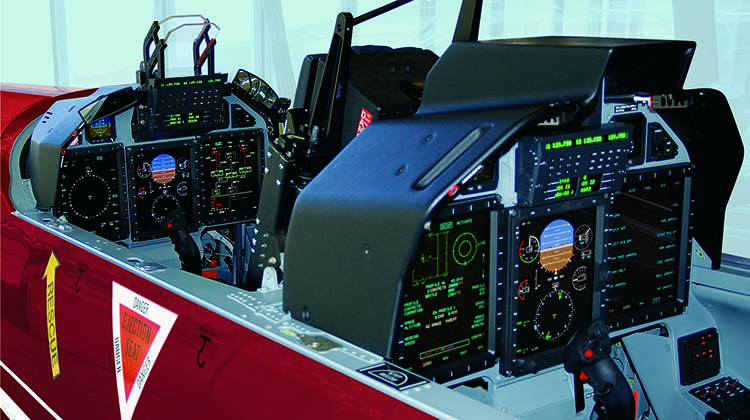 Unlike the procedural trainer, the sim is a PC-21 cockpit section, complete with HOTAS and three large colour liquid crystal displays (LCDs) and a simulated HUD with HUD projector. Additionally, it has the ability to activate the student’s G-suit to accustom them to the feeling of the pressure upon their legs and abdomen as the suit’s bladders inflate. The cockpit is surrounded by a substantial sphere on which a large detailed visual database can be projected, offering a substantial field of view. The visuals are supported by an advanced sound system, providing a realistic turboprop sound as well as those associated with any kind of weather. Consequently, the sim immerses the student in an environment that very closely resembles what they will see in their airborne sortie. Accordingly, they can make mistakes, pause and repeat in a way that a real flight will not permit. From laptop to cockpit procedure trainer to simulator to the PC-21 cockpit, each step is carefully measured and monitored, while recognising that each student may respond differently to various learning techniques and at a different pace compared to those students beside them. The traditional training path has served the RAAF well for nearly a century, however the student of today is also potentially different to those of yesteryear. Born of a technological age and in an era of greater cultural and gender diversity, today’s candidates potentially arise from a far broader background. It is something that Group Captain Dennis Tan, director of the Aircrew Training Transition Office, recognises. To accommodate the varying styles and rates of learning, the rigid hurdle that once existed at every single step of training is more focused on the outcome at each stage. The same goal and standard is to be reached, but each student may arrive at that outcome by a journey that best utilises and addresses the strengths and relative weaknesses of an individual. Philosophical questions also arise when substantial change takes place. One example is the presence of so much new technology for the new student, such as the HUD. Is it best to not include the advanced technology at first and then gradually introduce elements, or have it present from the outset with only a basic understanding in the first instance? That such issues are being addressed and such questions being asked are a strong indication of the maturity of the existing system as it seeks the best way forward. And the stepped process of the project also best utilises the technology of the PC-21, which can efficiently operate across a broad envelope as both a basic flight trainer and an advanced systems platform. Once competency has been displayed through the various stages of ground-based preparation for a mission, the challenge then is to execute the exercise in the air. Key to successful flight operations of any kind is the briefing and de-briefing components and the PC‑21 offers potential in this area that the CT-4B and PC-9/A just do not offer. Through the Joint Mission Planning System (JMPS), instructors and students are able to program a mission, load the mission into the aircraft and then use the data captured to review the exercise in detail after the flight. It is a system that has been used at squadron level, but not previously in the flying training environment, bringing with it yet another element of continuity that the student will carry through to their later duties. The options available within the JMPS are wide-ranging. All manner of charts are available as the mission is planned and the route and airspace can be further overlaid. Turning points, tracks, distances, fuel plan, lowest safe altitudes (LSALT), divert aerodromes and so on can all be planned and brought together as a visual representation on the computer screen. A traditional looking flight and fuel plan can also be generated as a backup, in addition to any instrument approach plates. Although not in the realm of the basic flying training student, the system also has the ability to replicate tactical missions. The system can ‘load’ the PC-21 with an array of ordnance and defensive chaff and flares. The run-in on the target can be represented on the route through symbology and an image can even be loaded for a visual review in the cockpit on a multi-function display (MFD) prior to acquiring the target. Threats such as simulated surface-to-air missile (SAM) sites can be loaded, just as a formation of airborne enemies can be organised at a bearing and height relative to the student’s aircraft. On the instructor’s activation in flight, the threats will be displayed in the cockpit with all the associated warnings and aural tones. When the planning is completed, it is loaded onto a cartridge, known as the removable memory module (RMM), with the contents validated before removing it from the computer and in turn loading it on board the PC-21. Once loaded, the RMM starts recording data and then audio following engine start. At any point through the flight, should an instructor wish to note an event, it can be time-stamped with a push of a button. This allows an efficient review post flight without having to hunt through an entire mission. Following the flight, the RMM, or ‘brick’, as it is colloquially known, is loaded back into the system and the mission can be reviewed in tremendous detail. To facilitate this review, each of the new briefing rooms is equipped with a large three-screen arrangement offering a range of data. One screen can display a map presentation, another the cockpit indications and the third, footage of the flight looking through the HUD. There is also the ability to view the flight three-dimensionally and observe the flightpath as a ribbon. At any stage, the mission can be paused and reviewed and any system page or frequency selection available to the pilot can in turn be called up to review the exact configuration and status of the aircraft at any moment. As a de-briefing tool, it eliminates any inaccurate perceptions or recollections by instructor or student and offers accurate data by which the mission can be measured and subsequent training can be tailored. Once again, GPCAPT Tan provides a balanced viewpoint, that while recognising the immense amount of information available, he is also very aware of the potential to become submerged by the volume. Drawing three or four key points from any de-brief still remains a very valid technique. 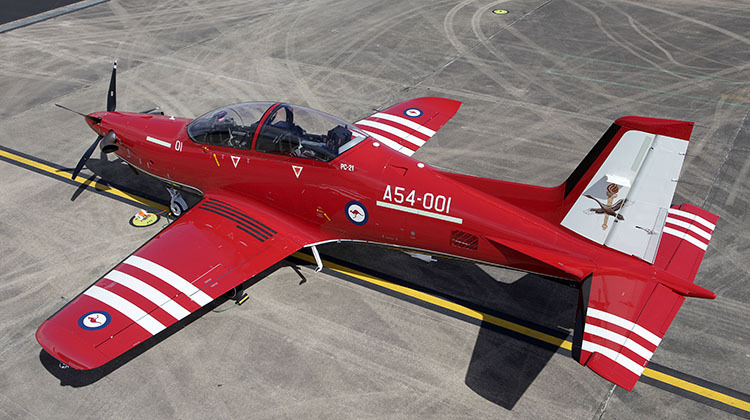 The PC-21 has the task of training the future pilots from their first flight to their graduation. As such, it should possess an operational envelope that ranges from a stable training platform right through to the ability to fly a low-level tactical mission, avoiding threats and delivering its load of ‘weapons’. The task of demonstrating this to the author was assigned to Flight Lieutenant Darren Wong and it was a process that gave an invaluable insight into the overall journey of the student pilot. By the time we were strapping into our G-suits, Secumar life vest and gathering our gloves and helmets, we had spent two days observing the student’s path, facilities and tools at their disposal. 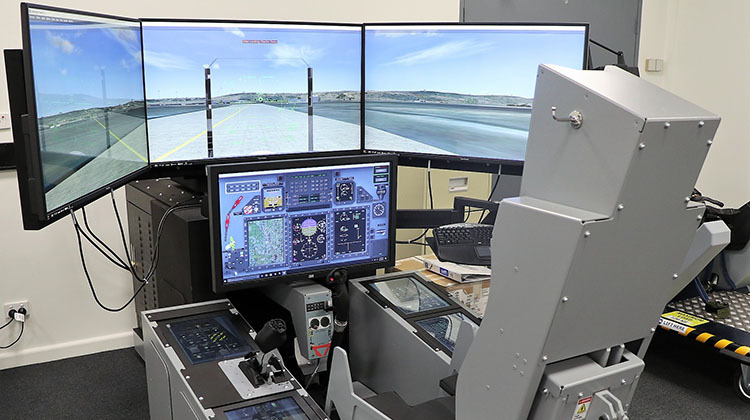 The Pilatus and Lockheed Martin software had been reviewed on the PLD and familiarisation had taken place with the CPT before a series of manoeuvres were flown within the sim, complete with G-suit. There were fittings of clothing and helmet, oxygen mask and a briefing on survival equipment, before a very thorough explanation of the ejection seat and training in the actions should we need to depart the aircraft. As much as we only tested the water, it was possible to see the logical path that the new pilot training system would follow and how each stage transitioned into the next. Armed with a solid foundation of knowledge and a thorough visual simulation of the mission ahead, one can grasp how the student will have the capacity to maximise their time in the air. Departing from East Sale, our mission was to comprise of a formation flight, followed by a low-level tactical mission with a simulated bombing run followed by an auto-coupled ILS approach before some general handling and a return into the circuit for a landing. It was far beyond a student’s mission profile but would serve to demonstrate the PC-21’s broad operational envelope. The mission was loaded and validated in the JMPS before the pilots involved sat down for a briefing with FLTLT Wong. Strapping into the PC-21 it already seemed somewhat familiar. Oxygen test switches, harness, G-suit plug, back-up radio test selector, emergency oxygen handle and ejection seat pin were all as FLTLT Wong had previously trained me. Not all of the switches on the HOTAS were relevant to me, but the trim, communications and autopilot disengagement switch were just like the CPT and the canopy operation was just like the simulator. I was comfortable because I had seen it before ever setting foot in the cockpit. As FLTLT Wong advanced the throttle beyond 40% there was an enjoyable push back into the seat. With power set to full, the system’s automation protects the engine against any exceedances while the offset engine and automatic rudder trim nullifies the usual yaw on the takeoff roll. Rotating at 92kt and with landing gear and flap retracted by the limiting speed of 180kt we departed for a formation flight with the other aircraft flown by GPCAPT Tan in company with FLTLT Steve English, the first RAAF QFI to undertake PC-21 training in Australia. Following the photo session, FLTLT Wong activated the low-level mission and we started our descent to 250ft AGL. Already our MFD was not only indicating our time over target and whether we were early or late, but what speed we needed to fly to achieve the desired time. As we weaved through valleys and over ridges, the G-suit periodically activated as the additional forces of gravity kicked in. The PC-21 proved very smooth and stable. The HUD presentation in the rear seat was a wealth of information, although one had to be wary that the outside scan did not suffer as a result of staring into the HUD. All the while our map updated our position and desired speed and with FLTLT Wong flying once again I was instructed in calling up information from the MFD and verifying fuel status through simple selections and with virtually no mental arithmetic needed. Approaching the target, a radio mast, he called up the Google image that he had loaded on the ground and we verified the target. Right on time we released our ‘digital bombs’, a fact confirmed by our weapons display. Back at East Sale an ILS was flown with the autopilot engaged before we conducted a missed approach to the western training area for some general handling. In the simulator the day before we had timed the PC-21’s deceleration in level flight, with and without airbrake. Now in the aircraft, the timings matched and as a student it was easy to translate what I had seen on the ground into what we practised in the air. And that is why the integrated training system and the choice of the PC-21 will allow students to execute their missions across such a broad scope of operations. As FLTLT Wong debriefed the sortie in company with GPCAPT Tan, I could easily compare the flight with the presentation across the three screens before me. We could pause and discuss any aspect of the flight without ambiguity or a fatigued recollection. As with every stage over the past two days, each made sense and seamlessly translated into the next, aided by the depth of knowledge and genuine enthusiasm of all the personnel involved. AIR 5428 is seeing significant change in the way that the RAAF trains its pilots. As CFS prepares for the next chapter in its proud history, it does so with new systems, infrastructure and equipment that offer it the capability to meet the challenge. However, in the future as in the past, it will undoubtedly be the calibre of the people that determine the degree of success. On that count, the RAAF is in good hands. This feature story first appeared in the November 2017 issue of Australian Aviation. Great looking platform. Well done AA and keep these defence articles coming! Similar to what the RNZAF have instituted with No 14 Sqn at Ohakea using the Beech T-6C. The RNZAF no longer operate any piston engined aircraft. Worked on PC9 when first delivered to 2FTS… lucky lads who’ll get that chance now and those new students as well. Am I reading this right.From no flying experience ,you get strapped into one of these things?? ?.What could go wrong…..or as Jeremy Clarkson says ,”How hard can it be ”. Interesting that we have done this before. A few years ago all training from start to finish was done in the PC9. It would be an interesting exercise to look at pass rates for those courses compared to the ones that learnt on the CT4 then transitioned across. Daryl, the trainees undertake classroom work and learn the basics, systems etc., in the simulator. So by the time they actually set foot in that aircraft they already have hours of simulator time, hence they are already familiar with the aircraft and how it handles. ngatimozart, sounds like common sense to me. Bloody nice plane! Wonder how many weather days are factored into the training program at East Sale compared to Tamworth? You’d have to think they would lose a fair few – just like Nowra versus Oakey for the basic helicopter training for Army/Navy. I’m guessing being politically the right location will always trump other practical considerations. Holden, the ADF successfully conducted basic flying training at Point Cook for decades, and now we have the advantages of simulation! The weather issue is much overplayed, Sale has the airspace and the basic infrastructure (ie a military base) to do the job. No doubt about it simulation is great, but courses are structured to need real flight time at certain junctures, and at those times, simulators are no help. Bad weather can cruel course timelines – for this exact reason many training centres around the world are positioned in fair weather areas. Excellent and very in depth article. However can’t help but think the RAAF is still having its chain yanked by defence contractors when a key learning platform seems to be the same Microsoft Flight sim I played on a laptop about 10 years ago! And the laptop in the photo also seems to be about 10 years old! And don’t get me started on calling a laptop a PLD. Hate to think what the RAAF used previously…maybe they just put you in real cockpit and see how much you screwed up, just like the rest of us did.